Man, oh man. And this still isn't the worst of the pics. I should mention that the Spidey costume was made by my indulgent parents. Mom sewed the costume and Dad airbrushed the webbing. And this is how I repay them? Huh. 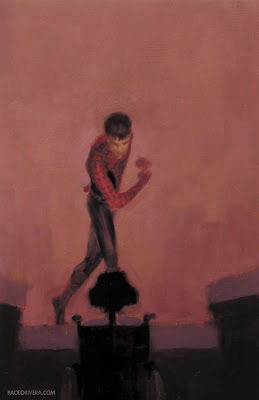 I'd wondered if you had Matt pose in costume for that issue.... I guess not? Fortunately, Christina, I spared Matt from such embarrassment — I had him pose in his regular clothes, then filled in the gaps later. 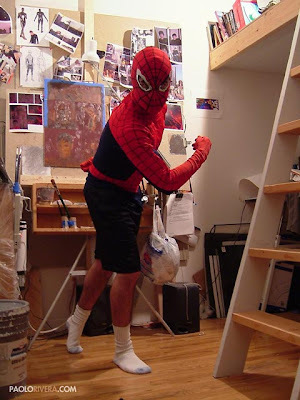 so....you have a home made spider-man costume? Y'know...i see nothing wrong with that. If only my wife were that understanding. Janimal, maybe that's the only think keeping me from having a wife.